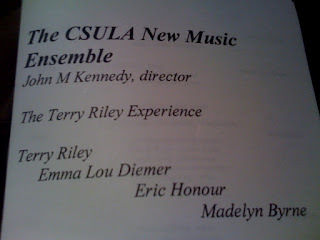 On Monday November 24 John M. Kennedy directed the CSULA New Music Ensemble in a program titled the Terry Riley Experience, the name referring to the two showcase pieces, Terry Riley's In C and Eric Honour's Haze. The first half of the performance began with Madelyn Byrne's Rain, Sea, and Sky, a piece for piano, vibraphone, and computer generated sounds. With the spare piano and the combined resonance of the bowed vibraphone and the recorded sounds this piece leaned towards the minimalist portion of the program. The totality of sound was the key here, with the vibraphone blending into the synthesised sound and the piano floating over the top, with no one sound source dominating. The harmonic stasis of the piece underscored the serenity suggested by the title. Next was the piece for two pianos by Emma Lou Diemer, Homage to Cowell, Crumb, and Czerny. The piece showcased various extended piano techniques loosely linked to the composers that the it was dedicated to. Between these techniques and the orchestral quality of two pianos playing together the composer achieved a particularly massive sound. As in the Byrne piece, the pure sound of the instruments was up front here. With few melodic and harmonic reference points the piece was a nice contrast with the first. After a quick set change a short film on guitarist Jimi Hendrix introduced one of the pieces that the evening's program was named for, Haze by Eric Honour. Loosely using Hendrix' Purple Haze as source material Honour essentially deconstructed the guitarist's music spreading motives and gestures across the different instruments. Particularly striking was the use of the cello as "feedback". Each motive was given ample time to develop, with the piece giving the listener a displaced Hendrix feel without overtly using material from it's source. Last in the program was Terry Riley's In C. This is a piece that really doesn't need much comment at this point. However, the ensemble performed it well, dealing with the obvious challenges that the piece presented. Kennedy ably directed the group, managing the subtle changes in the music.